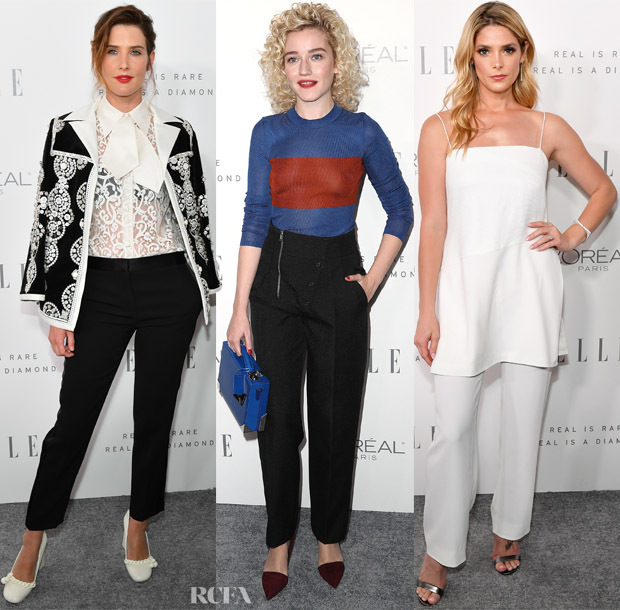 From ELLE’s 24th Annual Women in Hollywood Celebration on Monday (October 16) in Beverly Hills, California, we’ve seen the likes of Kristen Stewart and Jennifer Lawrence. Here is a roundup of the rest of the gorgeous actresses who were in attendance. Jessica Chastain: The vinyl Fashion Week trend didn’t go down too well with the majority, but Jessica put her graceful spin on the trend in Calvin Klein which is the most glamorous interpretation I’ve seen yet. Margot Robbie: After a colourful week promoting ‘Goodbye Christopher Robin’, Margot opted for the simple elegance of Calvin Klein. I adore the sensuality of this look, plus the embellished sandals. Zoe Lister-Jones: The Chinese influence of her gorgeous McQ Alexander McQueen floral dress is there for all to see. It’s the complementary styling of Irene Neuwirth and blue suede shoes which really perfected the look. Vanessa Hudgens: Brimming with boho flare, Vanessa’s Bora Aksu ruffled gown styled with a Jimmy Choo ‘Cloud’ clutch and a selection of jewels courtesy of Sara Weinstock, Graziela Gems, Effy, EF Collection proves that when called upon, she can present a winning red carpet look. Laura Dern: Part of the Calvin Klein-klan, I couldn’t get on board with this lime-green dress. The fit is somehow off despite the loose silhouette and I don’t think this is a great colour for her. The only thing I would save are the orange sandals. Julianne Hough: The dancer wore a beautiful Georges Chakra Spring 2017 Couture dress styled with an Edie Parker clutch. I’m very intrigued by the detailing. Alessandra Ambrosio: No prizes for guessing that Alessandra was wearing a Zuhair Murad Resort 2018 jumpsuit. Sometimes we roll our eyes when she does predictable, but here, predictable is looking pretty awesome. She styled her look with a Joelle diamond ear jacket, and DJULA black diamond ring. Abigail Spencer: Looking at Abigal’s Max Mara Fall 2017 oversized velvet suit and turtleneck combo I’m full of admiration for going against the grain and wearing a Fall look during the current season in LA. However, the only thing preventing me from fawning over this look is the colour. Had it been violet, emerald green or even black, this would’ve been one of my favourites at this event. Bellamy Young: Also opting for velvet, I love how modern this Temperley London jumpsuit feels. Norman Silverman jewels and Rene Caovilla sandals completed her look. Cobie Smulders: This classic black and white Tory Burch Fall 2017 look is all the more interesting with it’s intricate detailing. Julia Garner: The actress was colour-blocking in Calvin Klein. Ashley Green: Had Ashley added some accessories to this Jeffrey Dodd Spring 2017 look I may been a bit more excited about it. Minimal doesn’t have to equal uninspiring. Storm Reid: The young star wore an adorable heart emblazoned Reem Acra Fall 2017 dress styled with Casadei ballerina pumps. Cara Santana: The actress wore a dreamy Georges Chakra Fall 2016 Couture high-neck dress styled with rose-gold sandals which prevented the look from feeling too twee. Lake Bell: This figure-enhancing dress throws us a curve-ball with the flounced ruffle trimmed sleeves. Irene Neuwirth jewels plus burgundy sandals proved to be a refreshing contrast. Jamie King: The actress never met a frothy gown she didn’t love. This semi-sheer creation from Elie Saab’s Fall 2017 collection was punctuated with point d’esprit skirt for a truly romantic flourish. Giuseppe Zanotti sandals and Ileana Makri earrings completed her look. Cindy Crawford: A part of me wishes this dress came sans white ruffle. Reese Witherspoon: Calvin Klein dressed Reese for the event, and judging by this dress they implicitly know her style. Dressing her in one of their edgy fashion forward looks may have been interesting, but I’m not surprised stuck with tried-and-true. Irene Neuwirth jewels and Christian Louboutin ‘Aketata’ sandals completed her look. Nikki Reed: The actress kept things simple wearing a Victoria Beckham Fall 2016 cut-out gown styled with Edie Parker ‘Jean’ clutch, John Hardy jewels and Jenny Bird jewels. This is how present minimalist elegance. Grace Van Patten: The actress wore a Diane von Furstenberg strapless structured midi dress in a body-sculpting style which made her chic styling a breeze. Nina Garcia: The host of the evening wore a chic Calvin Klein utilitarian jumpsuit with aqua earrings which stole the show injecting some glam into her look.